The Adamair flight went missing during a domestic flight to Manado. Last contact was at 14:07 when the flight was enroute at FL350. Initial reports indicate that the flight changed course twice as a result of severe (130 km/h) crosswind. The airplane crashed into the sea. On January 11 part of a jetliner's tail, food trays and other debris was pulled from the sea. On January 25 a U.S. navy ship detected signals coming from the flight recorder. The FDR was recovered from a depth of on 2000 m August 27. The CVR was recovered on August 28 from a depth of 1900 m.
Investigators found that, during the flight from Surabaya to Manado, the Inertial Reference System (IRS) malfunctioned. Both pilots became engrossed with trouble shooting the IRS anomalies for at least the last 13 minutes of the flight, with minimal regard to other flight requirements. The pilots selected Attitude in the IRS, which disengaged the autopilot. After the autopilot disengaged and the aircraft rolled right and exceeded 35 degrees right bank, the pilots appeared to have become spatially disoriented. Control was lost and the airplane broke up and crashed into the sea. 2) The AdamAir maintenance engineering supervision and oversight was not effective and did not ensure that repetitive defects were rectified. An INCERFA (uncertainty) phase is required to be declared when there is concern about the safety of an aircraft or its occupants when communication is not received, or the aircraft fails to arrive within 30 minutes of a prescribed time. The ALERFA (alert phase) is required to be declared when there is apprehension about the safety of an aircraft and its occupants when communication is not received or the aircraft fails to arrive within 60 minutes of a prescribed time. 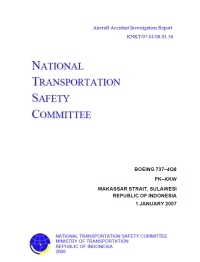 The National Transportation Safety Committee (NTSC) recommends that Angkasa Pura I review its standard procedures to provide an adequate assurance that alternative methods of positive identification and assessing if an aircraft is in distress, when radar track is lost, are promulgated to controllers. The standard procedures should ensure that the ICAO requirements for the declaration of INCERFA and ALERFA are met. The spatial disorientation and its effects. The National Transportation Safety Committee (NTSC) recommends that Adam Air should review the effectiveness of its training for cockpit crews, specifically related to crew resource management, safety critical systems, and the appropriate use of standard operating procedures, including the Quick Reference Handbook. The National Transportation Safety Committee (NTSC) recommends that the Ministry of Transportation review the related laws and procedures to ensure appropriate salvage capability is resourced and available without delay following an aviation accident requiring underwater aircraft wreckage recovery. In particular the laws and procedures should ensure the requirements of ICAO Annex 13 Paragraph 5.7 are met with respect to the recovery and read-out of the flight recorders without delay. DGCA to review the use of flight plan track display for controlling. The ATC controller to reconfirm when the target on the radar screen became as a flight plan track. The ATC controller to reconfirm the aircraft position during transferring to other sector. MAATS to review the use of color (green) in the radar display to indicate at their authority (jurisdiction). The regulator (DGCA) should review the airline operator’s training syllabus for cockpit crews, specifically related to Inertial Reference System, navigation system abnormalities. Ensuring that Indonesian airlines’ maintenance organizations have appropriate procedures to ensure the serviceability of the complete IRS system. Immediately require an extensive inspection of the Adam Air fleet of aircraft. Thoroughly review the adequacy and the implementation of the Adam Air maintenance program. All operators to review the training and operational procedures, to ensure that their pilots are appropriately trained in severe weather recognition and avoidance, and that pilots be required to adhere strictly to the flight procedure of severe weather avoidance whenever severe weather is known or expected; and the pilot should continuously recognize their present position and should report the reason if the pilot has deviated from the assigned track. MAATS to have enough number of ATC personnel to meet the operation requirement (for each sector with one executive and one planner). MAATS to do the recurrent training of ATC personnel in simulator every two up to three months for each ATC personnel (EUROCAT requirement). Distance from Surabaya-Juanda Airport to Manado-Sam Ratulangi Airport as the crow flies is 1666 km (1041 miles).